Philadelphia’s hottest “prospect” sine 1984 when Meldrick Taylor won an Olympic Gold Medal and went onto to win world championship titles is none other than Philly’s welterweight sensation Jaron “Boots” Ennis who will be headlining Friday night on the Rising Star Promotion at the Showboat Hotel & Casino in Atlantic City, NJ. They have a 9 bout card with plenty of talent for the fans to see. In the Main Event Ennis, 19-0 (17), will be taking on Greece’s “Mighty” Mike Arnaoutis, 26-10-2 (13), now out of Philadelphia. Ennis is the USBA’s No. 1 contender and he cannot get any of the other contenders to fight him for the vacant USBA belt. So the USBA is allowing No. 3 to fight a non-contender who happens to be from Philly. Why don’t they just give Ennis the belt? Trained by his father, “Bozy” Ennis at his “Bozy’s Dungeon” Gym above the Harrowgate Gym on Venango Avenue off of Kensington in Philly the elder Ennis had this to say: I’m well aware of the opponent. I had Demetrius Hopkins in with him (July 2010) and defeated him. We respect him and with his experience it’s a good opponent”. In the Co-Main Event Chris “Sandman” Thomas, 8-0-1 (5), of Tom Rivers, NJ, will be in one of the two NJ state title bouts on the card. 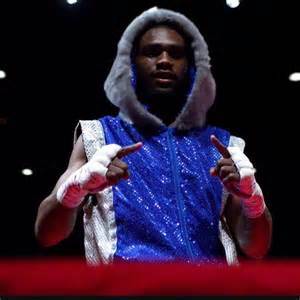 He will be taking on Darryl Bunting, 3-3-2 (1), of Asbury Park, NJ, over 8 rounds for the NJ State Middleweight Title. In the other NJ title bout in the heavyweight division Dan Pasciolla, 9-3-3 (0), of Brick, NJ, takes on Quian Davis, 4-0-2 (2), of Vineland, NJ, over 8 rounds. Back in March of 2016 Pasciolla won that title in March of 2016 defeating former IBF Cruiserweight champion Imamu “Young Ben” Mayfield. In the third eight rounder on the card Welterweight Yurik Mamedov, 9-1 (3), of New York, NY, takes on Kashon Hutchinson, 3-4 (1), of Reading, PA, over 8 rounds. Atlantic City’s Joe De La Paz, 7-1 (4), takes on Willis “The Prophet” Lockett, 16-22-5 (5), of Takoma Park, MD. Lockett has been a spoiler who last month defeated the former NBA champion Prince Badi Ajamu. In 6 round bouts Camden welterweight Vidal Rivera, 7-0 (4), takes on Jose Ramos, 11-13-1 (8), of Tijuana, MEX. Philly Super Featherweight Donald “No Love” Smith, 6-0 (3), takes on Deo Kizito, 2-1-1 (1), of Rubage, Uganda. Philly heavyweight Darmani Rock, 11-0 (7), looks to extend his winning streak against veteran Maurice Harris, 26-21-3, of Newark, NJ. In the only 4 round bout on the card Philly Super Bantamweight Angel Pizarro, 3-0 (2), who returns to the ring for the first time in 2018 taking on Terrance Moore, 0-2, of Wilson, NC. Also, Friday night Mis Downing will promote at the Claridge Hotel & Casino featuring Derrick “Take It to The Bank” Webster, 25-1, of Glassboro, NJ, taking on Oscar Rojas, 16-9-1 (5), of Monterrey, MEX, for the American Boxing Federation Continental Americas Super Middleweight title.